Update: Updated PoB, I'm going with EB over Arcane Surge for some extra defensive layers; will update guide to reflect end-game thoughts soon. You can craft 10% chance to Arcane Surge on Kill on Weapons, will attempt to fossil craft + master craft a new weapon to reflect that. Why do we care about Consecrated Ground? This is a crit spell build that has decent clear and is great for bosses (so far). We have so much regen, leech, and immunity that we can basically facetank most things. When approaching a pack, I place Storm Brand, which is how we generate Power Charges. This also gives us Arcane Surge. 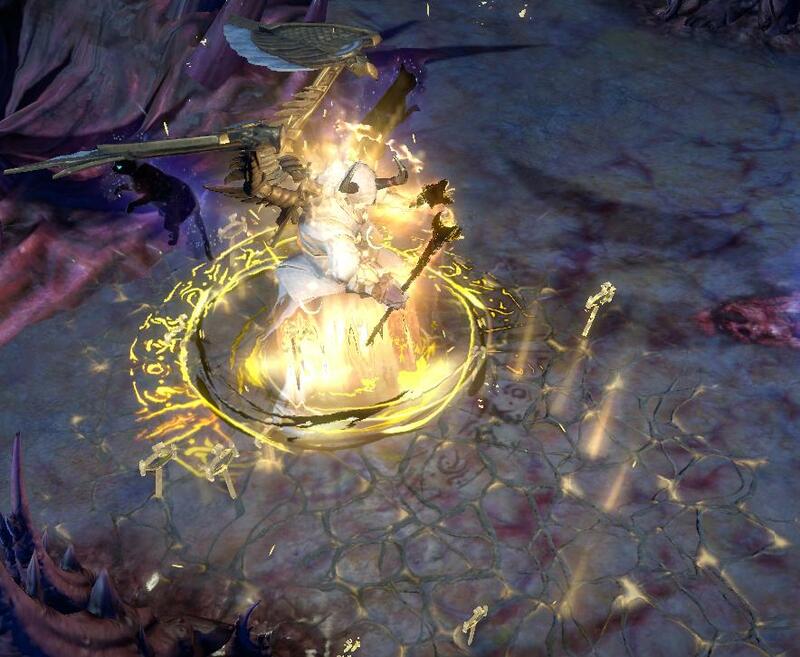 I'll use Consecrated Path to leap into the pack, or avoid the pack and proc "attacked recently", then slam them with our Purifying Flame, up close or from range, which will proc Warlord's Mark on Hit and give us Endurance Charges. I also use Flame Dash with Arcane Surge to keep Arcane Surge active (4 seconds) without having to put down another Storm Brand (10 seconds of power charges). 1. Crit Chance & Multi. You can easily achieve 400%+ Crit Multi from the tree and gear. 2. Elemental Pen & Fire Exposure. 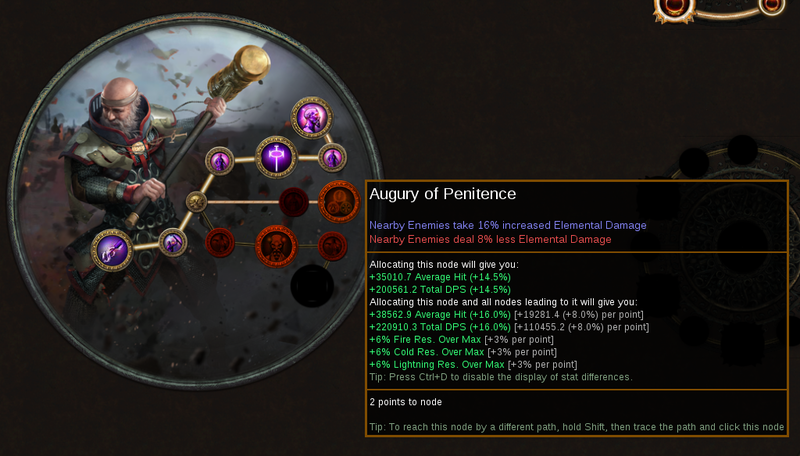 This is why we do not take the ascendancy node "Inevitable Judgment." With this build you will get enough pen & exposure to take enemy fire resistance below 0. 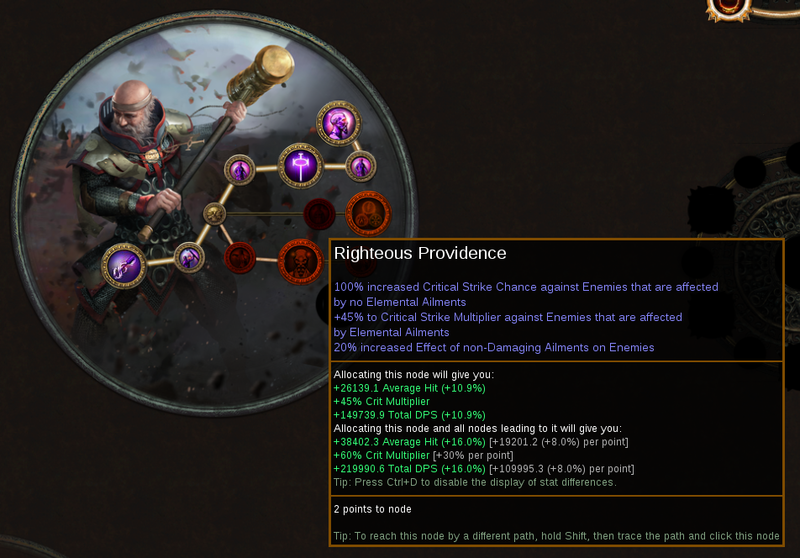 We have 11% ele pen from the tree, and 25% fire exposure from CWDT Wave of Conviction, and also ignites our enemies. 3. Avatar of Fire. Allows us to scale phys, fire, or other damage sources and only worry about 1 element, and no longer worry about phys reflect. 4. Intensify, Carcass Jack, & Bottled Faith. Being able to affect a wider area with our skills and our consecrated ground makes clearing faster and easier. 5. Attack & Spell doing Consecrated Ground. We get all the benefits from the attack/spell Inquisitor node while also doubling down on making everything consecrated ground. 1. Consecrated Ground. As listed before, this gives us an insane amount of regen. It's very easy to keep consecrated ground active under us, and under our enemies, constantly (8 seconds is a long time in game). 2. Warlord's Mark on Hit. Whether as a ring or in your Storm Brand set up, we hit with multiple skills, making leeching easy. 3. MoM Since we regen/leech so much mana and ES, we can double down on these two defensive mechanics to greatly enhance our EHP. On consecrated ground we regen 200 ES/second, which is amazing. 4. Elemental Ailment Immunity. Technically a benefit of consecrated ground but can't be understated; being constantly elemental ailment immune frees up flask rolls for warding and staunching, as well as keeping you safe from boxes to bosses. Take Alira for them sweet Crit multi's and mana regen. I crafted my 1st weapon with Scorched + Aetheric Fossils. Crafted gloves with Scorched + Pristine Fossils. Note: If you cannot afford a Warlord's Mark on Hit ring, use alternative Storm Brand set up, at the bottom of gem links list. Did you level with purifying flame? What's the purpose of the storm brand setup? Only to proc arcane surge? Yep! I leveled with Purifying Flame and a self-cast Wave of Conviction. It was pretty easy leveling/league start! Where are you getting EB (Eldritch Battery)?